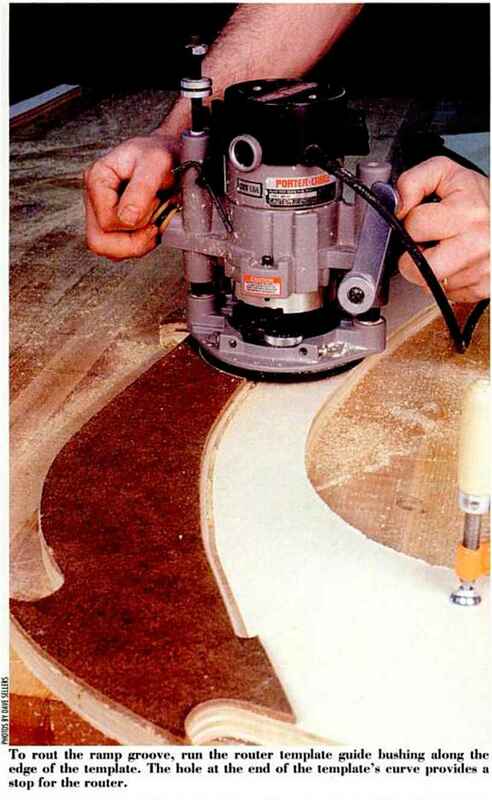 To rout til«* ramp groove, run the router template guide hushing along the edge of the template. The hole at the end of the template"* curve provide* a *top for thr router. The sides are splayed from vertical, so you'll have to cut a matching bevel on the 1-in.-thick treads and nosings and a gentle curve on the edges of the ramp. (See drawing.) Construction is straightforward, though final assembly will require a helper. 1 designed a two-piece template to define the shape of the side pieces and locate the grooves that hold the curved ramp. Begin by laying out the overall shape and cutouts for the handholds on '/«-in. hardboard, using the grid lines in the drawing. Next, lay out the curved line for the groove in the template. Each end of the curved line terminates as a tangent to a V^-in.-dia. hole, as shown on the grid. The holes will act as stops when you rout each groove. When the layout is finished, cut the template to size with a saber saw. then saw along the curved line, cutting the template in half. To form the side pieces, rejoin the two halves of the template temporarily and fasten them to a piece of -Vein, birch plywood with double-sided tape. Rough out one side piece with a saber saw, keeping about VI6 in. from the template edge. The rounded ends of the handhold area arc a tight curve for the saber saw, so I made these with a 1 !y.*-in.-dia. Forstner bit and then sawed out the rest of the opening. Save the waste from the handholds; you'll use it later when laminating the mils. Next, rout the side to finished size, using a Vi-in.-dia. pattern bit with a shank-mounted pilot bearing (available from MLCS Ltd., Box 4053, Rydal. FA 19046, 800-533-9298). Now you're ready to cut the groove. Remove the bottom half of the hardboard to expose the groove template. Mount a $Win. straight bit in your router and a Vi-in.-dia. template guide bushing on the router baseplate. 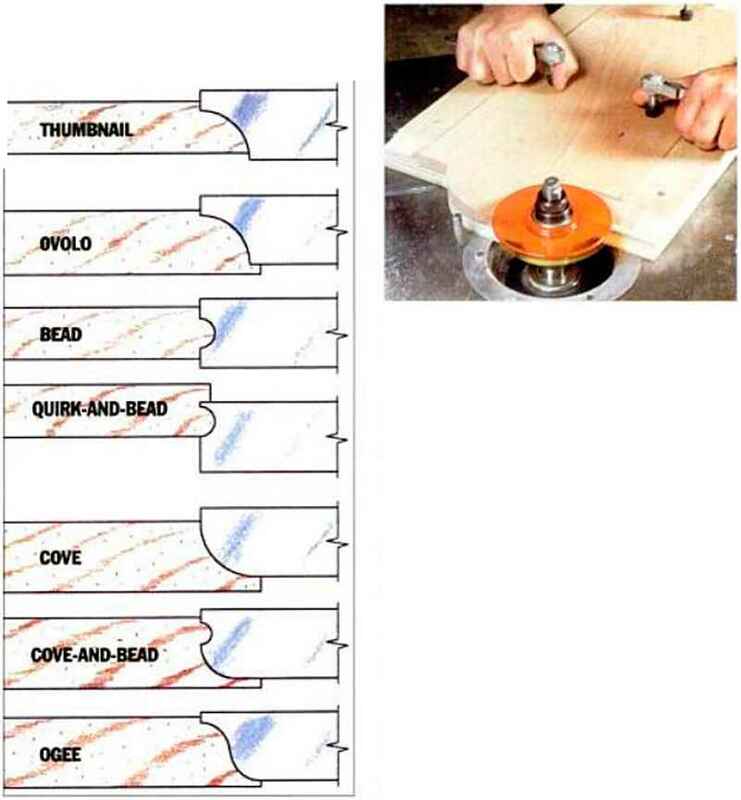 Rout a S»-in.-decp groove, following the template edge, as shown in the photo. Now rout '/i-in.-deep dadoes for the steps, using a straight bit. You can clamp a straightedge to the side and use that as a fence to guide the router. Make the second side piece like the first one, except rout a dado and groove on the opposite side, making the left-hand and right-hand side pieces mirror images. Complete the side pieces by gluing on the laminated oak handrail described in detail in the sidebar. Finally, radius the edges of each side piece with a router and a '/«-in. round-over bit. to ¡bM'inlili1 in«1 »lid«*. iM'iiil III |ii«MM> a* your helper *tart- tin finish coat of paint on their insides. Assembly is simply a matter of bending the hardboard ramp to fit the grooves and driving »8 by 2-in. all-purpose screws through the sides and into the treads and nosings. Well, at least it sounds simple. This is one of those operations that requires at least two pairs of hands, so get help. On the tahlesaw, cut a '«-in -deep rabbet on the top of the two nosing pieces. (See drawing.) When you glue the ramp in this rabbet, the hardboard w ill be flush with the top of the nosings. lest the fit to make sure there aren't any protruding edges to scrape lender Ixntoms. 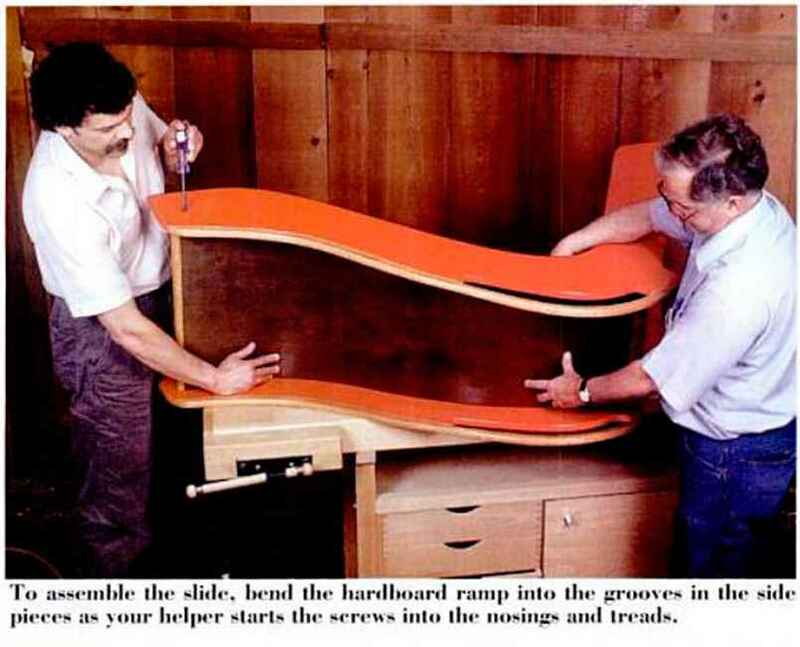 The hardboard ramp is the easiest part to make. Simpb la\ out the gentle curves on 's-in. tempered hardboard, following the dimensions in the drawing. 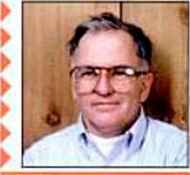 then cut them with a salx-r saw.